Based on the bestselling parenting book 1-2-3 Magic"e;If you only have time to read one book about managing student behavior, make it this one. "e;"e;This book is a great resource for new teachers and veteran teachers. "e;The fastest way to get back to what you love--teaching!Being a teacher can be one of the most rewarding professions, but also one of the most frustrating. Many teac… hers feel very prepared to instruct students in their chosen subjects, but don't have quite as much training in managing classroom discipline-yet experienced educators know that if challenging behavior goes unchecked, the entire year can be disrupted. 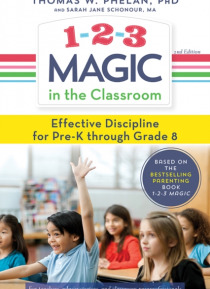 1-2-3 Magic in the Classroom shows teachers how to establish and maintain good discipline habits in their classrooms through an easy-to-understand program that you'll swear "e;works like magic. "e;1-2-3 Magic in the Classroom will help you understand:* How to encourage courteous classroom behavior and constructive work habits* How your personality affects your teaching style* How to effectively manage transition times with your class* Successful methods for handling assemblies, recess, lunchtime, and field trips* How to communicate productively with parents1-2-3 Magic in the Classroom takes the guesswork out of classroom discipline and will help you get back to teaching and your students get back to learning-today!